Managing Editor Matt Thacker makes his selection from the Winter 2017 issue. We publish one article from each edition on the website, but you can see the rest if you subscribe or buy a single issue or four-issue bundle. Matt has opted for Kamran Abbasi’s piece on which series matter most to him. The Ashes is all-consuming. As soon as it’s finished, the next series seems to be all about preparation for the next big one, the next time England and Australia go head to head. So it was good to hear from Kamran Abbasi that not everyone shares this unhealthy view. I’ve never properly felt the buzz of the Ashes. I understand it, of course. History. Rivalry. Socio-political undertones. Colonial legacy. But I’ve never really got it in the sense of the Ashes being the greatest show in cricket. I’ve never felt the emotion – that something deep inside that pushes a contest beyond a sport in a fan’s mind. I’ve never been nervous about my adopted country’s fate in any sport, except perhaps penalties in the 1990 World Cup semi-final against Germany. It must be the immigrant in me. In the days of Maggie Thatcher and the Tebbit Test, when being an immigrant was as stigmatised as it is again now, I never questioned my indifference to the Ashes. It wasn’t something that defined a five-year-old from Lahore who spoke little English and whose first home in England was a bedsit in South Woodford followed by an overpopulated terrace in south Yorkshire. One of my earliest memories is sitting on the pavement outside another house in Rotherham’s worst estate (we’d moved up the housing ladder to a council semi). It was the day before a National Front march in the town and I told our very white neighbours, the kind who would now be a target for UKIP campaign managers but were then old-school working class, that we’d be forced to leave England. In that moment, I truly believed it. Pakis, the word used for all Asian immigrants, would be sent home. It was a horrible day and the thought of the march, of the hate, of the skinheads, and of the support these foul people were gathering, filled me with a desperate apprehension about the future. We’d come to England in hope, looking up to the British sense of justice and fair play, only to discover a bitter reality of hate and rejection. I knew nothing I’d done to deserve it. Just as I didn’t deserve the racial abuse at school, both from so-called friends and people I didn’t even know, or the violence my family experienced, which left me glad that one of my uncles chose to fight back. Nor the death threats and bomb threats that meant a police officer occasionally sat outside our house. Then there’s the prejudice that you can’t prove but everybody knows, which means somebody less able than you is selected for jobs and sports teams. Yes, there’s plenty that my community can improve and put right. Integration, tolerance, and acceptance work both ways. But tell me why an immigrant to England who lived through the unwelcoming racism of the 1970s and 1980s should immediately care about supporting England in sport? When you’re considered the enemy within, one small pleasure is from your host country’s misfortune. This isn’t being ungrateful. It’s just being human. So when England failed to qualify for the 1978 World Cup it was easy to put heart and soul into Ally’s Tartan Army. When West Indies, a team that represented all of us immigrants, made England and its South African imports “grovel”, we smiled and relished the sweet justice. That’s why, in the beginning, in the grey ’70s, when I did come across the Ashes, Australia were my team. This wasn’t just payback for the racism I experienced. Australia were ex-colonial kindred spirits, yes, but they also produced some special players. Dennis Lillee and Jeff Thomson were the world’s most feared opening bowlers. Then there was Rodney Marsh, a wicketkeeper of irrepressible spirit, and my favourite Greg Chappell, as stylish a batsman as the game has known. England’s players were less classy, less appealing. Not that the Ashes mattered much in any case – somebody else’s battle. It was Pakistan’s visits that we lived for. Thousands of miles away our country was breaking free of its colonial legacy, and Pakistan’s success on the cricket field was the most obvious symbol of progress. Despite our personal situation, it was a more optimistic age for Pakistan and the world. As an immigrant, an unwelcome resident, it’s hard to find pride in your existence. What do you stand for? What brings you respect? What earns you status? The Pakistan cricket team had the power to bring us all that, or so we believed, which is why every result against England mattered, each win was glorious and each loss a kick in the guts. It was no different for immigrants from the West Indies or India. Our mood swung with every high and low on the cricket pitch. And there was another rivalry. Pakistan and India played each other regularly enough. Sunny and Zed. Bishan and Mushy. Later it would be Imran and Kapil, Javed and still Sunny. In terms of population, it is the greatest contest in the world of cricket. Numbers, we also know, don’t tell the full story of what has passed between these two. A country divided in 1947, friends and families separated. A refugee crisis of unprecedented scale, with murder and pillage on both sides of a new border. An ongoing conflict over Kashmir, followed by an open wound over Bangladesh. Wars and countless skirmishes. Yet, deep down, we shared a common history, a common culture, a common blood. How could the Ashes, for all its convict stories and class struggle, compare with the legacy of Partition? For a Pakistan fan, those were good times. Pakistan dominated India right up to the 2003 World Cup. When the countries struggled to play in south Asia, they were able to continue their contests in off-shore venues, namely Sharjah. 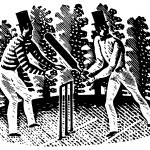 We now know that those games were a soft target for bookies and match-fixers, but the great rivalry was becoming a sporting spectacle just as the political power of both countries began to rise in cricket. In truth, they needed each other, or perhaps more accurately, India still needed Pakistan, and at the time it seemed as if the partnership in cricket would somehow transcend the skirmishes that politicians and military men were fond of. Those days are long gone. India is the dominant force in cricket politics, far outgrowing any reliance on Pakistan. Its cricket team is dominant too. Pakistan is a cricket nation of guerilla warfare, a successful raid here and there, the 2017 Champions Trophy being a perfect example, while India is a superpower building an impregnable cricket empire. And that is the crux of the issue: there is no longer parity between the combatants. Partition happened more than 70 years ago. What was once a deeply felt rivalry for the south Asian diaspora is now merely banter. Pakistan, the outsider, is still keen to give its well-off brother a thick ear. India, you suspect, sees Pakistan as little more than an irritation. Its head and heart have been turned by Australia and England. The television figures may say otherwise but it isn’t much of a rivalry when the teams only meet in the sanitised environment of an ICC competition. It isn’t much of a rivalry when one party is happy to go without. It isn’t much of a rivalry when the teams are generally ill-matched. This is a shame because it was in these contests that some of the world’s greatest players announced themselves, staked their claim as heroes. India playing in Pakistan, Pakistan playing in India; this was the essence of rivalry, of contest, of sport transcending life. All this is gone. The India-Pakistan rivalry is a rump, a flailing kick of a dying dog. And the Ashes is now everything that we don’t have. It is regular, home and away, plays to full houses and close enough as a contest. Despite all this, I find it hard to get worked up about the Ashes. As an immigrant, I know I’m not alone. I now support England as a second team after Pakistan but I don’t feel emotional about England in sport. My wife and children are English and they do feel something, the passion of a supporter. I’d need to feel that passion for the Ashes to matter to me. I did feel it once, in 1981, when Ian Botham’s one-man show overturned impossible odds and I kissed forever goodbye to any soft allegiance to Australia. Some people of my generation would still never support England. The wounds are too deep and they are too often re-opened. That’s disappointing. I love this country, its language and its culture. I love how despite everything, despite the National Front and the BNP and the EDL, despite Enoch Powell and Norman Tebbit and Brexit, this is a tolerant country willing to accommodate all religions and cultures. Just as we complain that all immigrants are tarred with the same brush when something goes wrong, why should we hold all English people responsible for the behavior and actions of a minority? One of the more lovable traits of the English is their ability to be genuinely outraged at unfairness and prejudice in their society. That’s something people of all backgrounds can learn from. But that doesn’t mean I buy the hype around the Ashes. As soon as one series ends, the sell for the next one begins. The Ashes becomes the point of reference for most conversations about form and selection. To the English at least, and I guess it is the same in Australia, the Ashes is on a pedestal. It is presented as the benchmark of quality and importance. All other contests are downgraded. You might be in the middle of summer engrossed in a monumental series between England and one of the best teams in the world but broadcasters’ and journalists’ minds are on the Ashes that winter. What do England need to do to get ready for the Ashes? What does this performance mean for the Ashes? It’s only 18 months away. Just round the corner. But Australia and England have done what India and Pakistan have failed to: they have managed to preserve the status, the frequency, and the public interest in their series. India and Pakistan would be the greatest rivalry if we had half the regularity and the organisation of the Ashes. But it doesn’t. We are what we are: squanderers of potential, backstory wastrels, unfulfilled rivals. So for me, the contest that really matters, that fires my passion and keeps me on the edge of my seat, is the rivalry of immigrant reckoning, of settling a score that goes back a lifetime. You can keep your Ashes. You can forget your India-Pakistan blood-brother duel. The rivalry that means more to me than any other is that between Pakistan and England, for the simple reason that this is a collision between language, culture and religion that has defined my life. 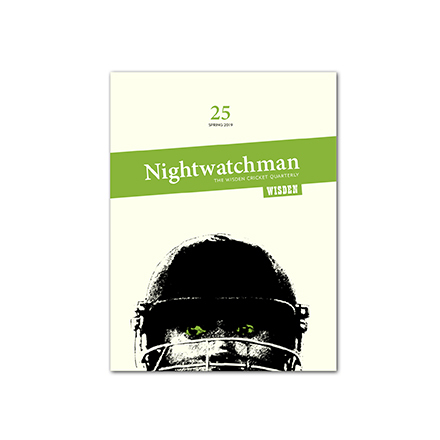 Issue 20 of The Nightwatchman, is available to order in both print and digital formats.